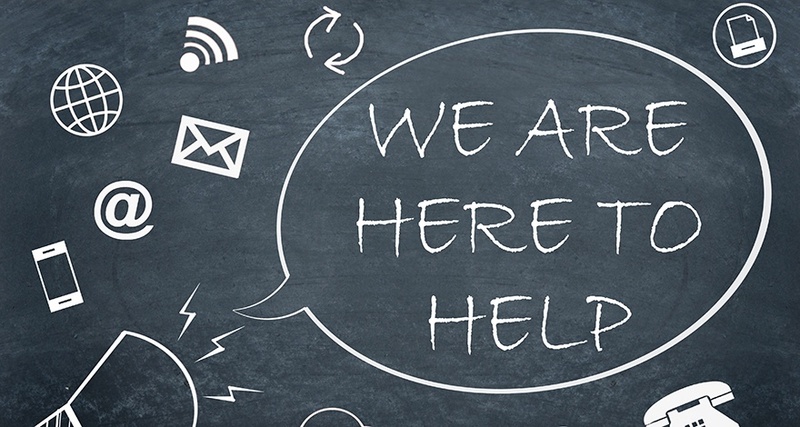 It’s commonly accepted that running a customer service department is a tough business; process oriented omnichannel customer service is the best solution for this challenge. Customer service is important to an organization for a number of reasons. Today all customer relationship management approaches are affected by the changes in business environment, new customers, existing customer behaviors, products, and competitors. But through it all, one thing remains constant: the obligation for providing a high level of customer satisfaction. That is why customer experience management is a tough job. Below you can find series of confessions of a customer relationship manager. Let’s look closer together! Providing excellent customer service should be an existence purpose for every business, right? But what comes to mind when you think of complaint management? Where do we look for solution? You know all these questions can be answered with a simple term: the “call center”. Are we too sensitive about our customers? Ok then, we can handle it; let’s establish a call center and deal with them. Great, that’s just what we need! We had purchased the best call center system; recorded all customer calls. Also had an intelligent voice response system and beyond that we started a great technology investment which most call centers can only dream about. I know it sounds cliche, but trust me. For sure we had created our in-house systems by using the world’s most recognized enterprise applications such as ERP, HR, CRM, e-mail, and others. Then we brought in professionals to train our people; shifts and break times are fixed! Team leaders, supervisors, motivational activities… Yeah i know, we had gone the whole nine yards. Our company have an IT department and expert consultants; daily budgets, meetings, project plans, project completion dates according to changing needs, postponements, and rollovers had indeed become the all too familiar routine. In the meantime, thanks to our customers’ never-ending requests, these complaints were creating our call center experience continuously. If our centre’s walls could talk, they’d tell the whole story. They had kept posting complaints through all channels and platforms. Kept going conversation with the company on website, Twitter, Facebook, almost every digital channel you can imagine. Some of them even came into our stores to express their complaints face to face. As our call center had grown, so had the customer complaints; we outsourced our call center. Yet, complaints continued to mount at the centre from customers. We changed again, and yet again, had brought call center operations back in house as a result of these valuable insights. Well what a surprise! These solutions didn’t work for us, even some of our customers complained about the call center that we have established to solve complaints. First the customer sent an e-mail and contacted our call center straight afterwards. This is fine, but the customer service agent had not the slightest clue about that mail! How could she/he supposed to access the information, tells agents the current status of the customer complaint? Neither the CRM system, nor the automated mail system were able to relay this crucial piece of information to the call center staff. This left us to look for it manually. When we had asked the back office agent, he said: “I have sent an email to the operations department”, showed us the records that he kept and we saw that there was no response. On the other hand, when we had asked the operations department, the reply was like that: “The customer query was not directly related to me; so I called the customer, got information about his complaint and I referred him to another department by giving the department’s phone number”. So we called the department which the customer was referred to find out about the status of the complaint. It seems the customer told his complaint to that department, too. Time passed away. In so many systems, there is neither a person nor applications that had no clue what was really going on. It was totally chaos. Meeting the complaint; to wait by emailing the unit, branch, store or supplier; trying to follow in the manual tabs… This was driving both customers and us crazy just because of a lack of process oriented omnichannel customer service. 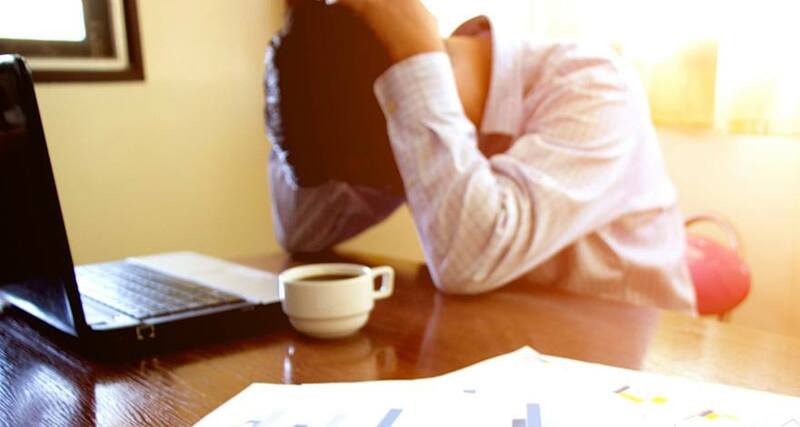 The customer repeatedly called contact center, certainly had a legitimate complaint, and this frustration caused him to develop bad impression about our company’s work style. The case negatively impacted both staff and corporate reputation. Without customers, we wouldn’t be in business, so we were most likely losing customers to our competitors, just simply because of this issue. The only solution to this problem requires end-to-end visibility by tracking, managing, and resolving complaints on a single platform. There is a contradiction between the profile of our customer service employees and what we expect from them. We tend to expect from young and inexperienced agents to face the most unhappy customers and find solutions to their problems. There is a sure thing we can all agree with when it comes to a call center: they are crucial to the customer service process. So who would be best qualified to respond to the customer query? Should I escalate the call accordingly to the relevant department? These are not the issues that call center agents should and should not do during a call interaction. An agent should only be supposed to know how to “categorize” the complaint rather than making decisions. As a corporation, we had to use fixed the policy that guides us on how to respond to different customer complaints. We ended up losing customers with trying to figure out how to respond to a certain customer complaint every single time. We had no idea what products and services, in which regions we get the most complaints. There weren’t enough reports to tell us why delays occur in departments and regional branches. It was a serious issue that we weren’t able to track how statistics change over time according to channels, categories, departments and branches. Our customers might have a sense about the root causes of their complaints, but we weren’t able to diagnose the issues very clearly. This is because we didn’t get the information from our systems. What difference would it make if workflows were changed for a particular kind of complaint or special sections were inserted on to the page to retrieve this information from the customer himself? In that case we would have to ask for an appointment from the IT department, consultants, and explain to them why we want this change. Perhaps they could listen and agree with us. But that won’t be still enough, because most of the time they are so busy; they’ll need to make a plan to implement these changes. And you can’t blame them for that; we’ll have to wait until they find time for us in their busy schedule, but what about our customers? Will they wait too? People do not have any time to lose. You never learn anything by doing it right. We learned that from our experiences. And finally there it is! A simple solution that helps us get through really tough times. We met Mi4biz which is a widely acknowledged product which is sold worldwide. It is a cost-effective Omnichannel solution. In the cloud system, you pay a monthly rent per each user. There are no exponential payments or implementations dragging on for months or years on end or mandatory usage periods. Mi4biz allows you to design and develop each process and each page. You won’t even need us or a separate IT department. No need to choose the most tech-savvy employee among you. Make your own decisions and make your own changes! I know, it sounds really cool right! The omnichannel solution provides unique end-to-end mechanism, allows you to manage the whole process, from the moment the issue has been raised to the moment it has been resolved. All this process brings together your departments, branches, stores and suppliers by a single platform. All your customer relationship questions are answered on this unique solution mechanism. The system instantly tells you who first responded to the customer query; to which departments or persons it was then escalated; and who worked on the customer complaint afterwards; and who is currently in charge of it and what will be done next. You know, one of the first challenges to providing great customer service is to decide where to focus time and resources. In this cases your customers’ feedbacks are so important. 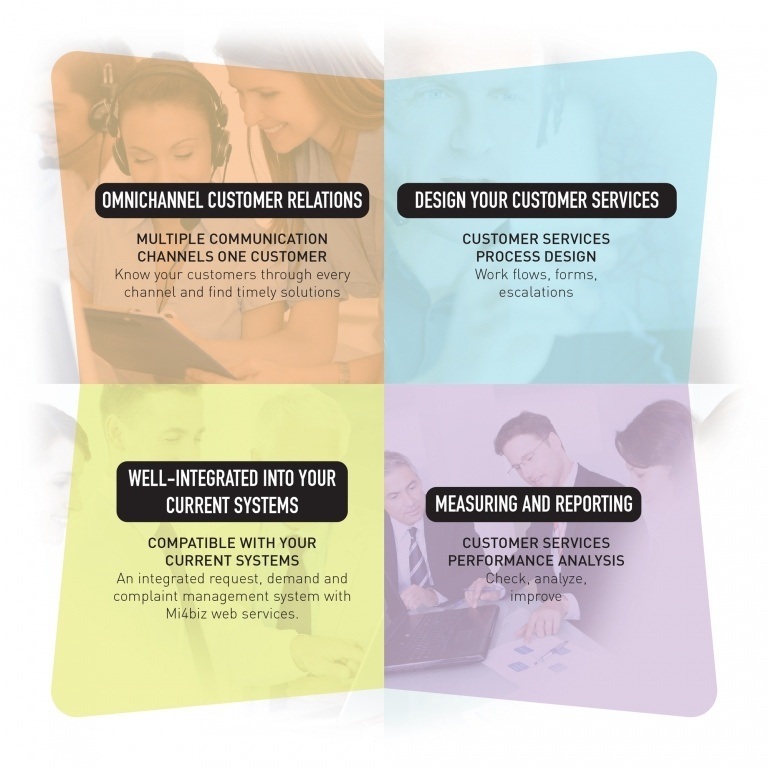 The omnichannel customer service solution provides every aspect of your customer’s past and all the information associated with it, whenever you want, in every angle and a single screen, allows you to ensure all of customers have a better experience. So the customer first sent an e-mail or tweeted, then called the call center? All customer conversation history is stored in one place at your fingertips. The agent has information, and he/she can get it very easily. What had been done, what’s next, and all the other necessary information are in front of the agent. No need for duplicate entries and customer to tell his/her claim over and over again. 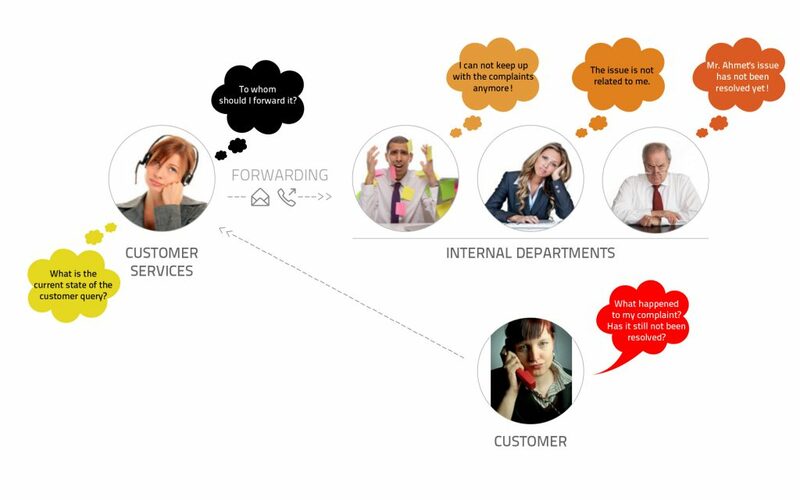 Mi4biz’s omnichannel solution mechanism keeps the customer constantly informed and engaged. Communicating to the customer via SMS or e-mail the status of his lodged complaint and the steps that will be taken to resolve the issue. The customer must be ensured that something is actually being done to bring his/her complaint to a resolution. The system keeps your employees constantly informed about the tasks assigned to them. They can interact just with using an omnichannel solution on the cloud by a computer or a mobile device wherever they might be. All they’ll need is wi-fi connection. Mi4biz keeps the managers constantly informed of delays, also allows you to fictionalize escalations and carry them to the highest level. When there is a delay, simply inform the first line of manager on the escalation. The solution gives additional time for the resolution of the problem. If the problem has not been resolved yet, escalate the issue to the next manager in line or even to the top management. Just like the way you have fictionalized it! A solution mechanism which only requires the agent to determine the type of the complaint. Mi4biz allows you to predefine how the complaint is going to be resolved. In short, it is a solution mechanism where you define beforehand the whole process relating to the resolution of customer complaints. Mi4biz increases your agents effectiveness, so they can provide better customer service. The system keeps track of each step, each department and employee on the basis of criteria such as products and categories until the issue has been resolved and provides feedback on the dashboard and through reports. Allows you to constantly gauge any change or slip in standards and make timely improvements. Yeah, we made it with Mi4biz, a fully customizable and easy-to-use process oriented omnichannel customer service software which is designed to enhance customer service as well as maximize companies’ sales efforts. So i am telling you, this solution is the real deal. Still, many companies don’t use the best software solution as an opportunity to reach out to their customers and really get to know their requests. We learned our lessons hard way. But what if you didn’t have to make some of our mistakes? You’d save your company’s time, efforts, and money, so that you can focus on the growing your business. That’s why I shared my story. Trust me, Mi4biz is the best software solution that has enabled brands to deliver excellent customer service.